As if anyone cares. The "What I HATE about BMW" is the entry that got so many views and generated so much discussion on the Interwebs. That last screed was more about BMW's GS brand becoming more "gS" (less dirt, more street), but I should note that there are a few things that are known to make the new GS/A 1200 LC bikes better in the dirt: longer swing arm that allows for more efficient rear suspension, a higher snorkel for those deep water crossing and the ability to retain front abs which makes it a lot more fun in dirt cornering. I'm sure the list is longer but since I don't own one yet, I can't say (although I would love to do an XLADV "project bike" ). As far as my own '11 GSA (oil head) goes, what's not to love? The thing will go nearly anywhere, tractors well with that low enduro gearing, cruises comfortably on the highway and is arguably one of the most versatile bikes ever made. I can tour with a pillion, carve canyons, do track days or just ride out and do some very challenging desert tracks. That versatility is a real value in that I don't need a truck and/or trailer with all that extra gas and time; I just hop on my bike and I go. You have to love the heritage as well. I wish I could find it but there's a graphic I saw on FB somewhere showing an old R100 and said "a 40 year old BMW still looks better than any new Honda." BMW has really been around a LONG time. KTM, not so much. And even if it weren't for people like John Penton, KTM would still be making lame scooters. BMW's heritage shows in their attention to detail and the degree to which they will spend engineering time to not only make something work properly (rather than the cheap route), but will go back to fix things that may not have worked so well ('13 and half of '14 LC GS frames). I can also admit to loving the GS riders. Many will call us smug, arrogant, etc... but my experience has been nothing but positive. I have met some really wonderful, kind and interesting people riding GS's over the years. They're amazing ride organizers too! They really know how to put an event together and have a great reputation (GS Giants). Other bike mfg's don't really have that halo. I've bashed BMW for seeming to care less about the dirt rider over time but they do stand out for their support of off road training and do still hold the bi-annual GS Trophy competition. BMW has become like a good friend to me. Sure, some of their traits may grate on my nerves from time to time, but they are still special to me and worth keeping around. What I Hate About Facebook! There are many things I love about BMW Motorrad that I will cover in a separate entry, but for now I'd like to just talk about what I HATE! Well, hate is a pretty strong word. Dislike. Disappointed. Let-down. Maybe that's more appropriate. Maybe it's mostly a function of who I am and what my expectations are from that particular brand. I'm more of the "adventure enduro" rider than the guy who might take his GS/GSA on some very nice graded dirt road for a mile or two in a national park once a year. I've heard something like 90% of GS/GSA owners never even take them off road. Maybe it's just asking too much for them to act in a way that pleases such a small part of their market? Let me start with their abandonment of off road racing. I don't think since their last Dakar in '01 BMW has done anything with racing off road. I guess that's not entirely true if you consider the HP2 in '06. But since then what? I remember chatting briefly with some guy from BMW USA at the GS Trophy competition in Moab in '12 and he didn't seem all that excited to be there. I would have thought a marketer from BMW getting the chance to be at an event like that would elicit more excitement, curiosity and inquisitiveness. When their new LC version engine came out with its wider wheels and radiators I was like c'mon, what are these people thinking?!! I did not see any way these bikes were going to be better off road. Better on road for sure. I've since tempered my thoughts there (better OEM suspension, enduro mode w/front abs) but it is a fact the lower enduro gearing isn't there anymore. What really bugged me was this video where I see "scarf boy" pointing out the various design lines and contours on the new GS. This had me thinking, "I bet this guy has never ridden off road in his entire life!" I'm less bothered by scarf boy than I am the scarf boys they seem to be marketing to nowadays. Alexander "Scarf Boy" Buckan at 1:49 Then was their "One World, One GS" promotion. This was a contest where they opened it up to the entire world, soliciting entries from GS riders everywhere. I even filled out an application They would pick five winners who would each take a GS for a week or two in some exotic location (e.g. Laos, Europe, Africa, etc...). The idea being the same bike would be transported to each region for the next winner to ride. When the winners were picked, I was not the only one who was stunned to find guess what? They picked one winner from each of the EU5 countries: Germany, Spain, France, Italy and the UK. More like "One Continent. One GS." What I finally realized after talking to many others about this is that BMW sells A LOT of GS's in Europe. These bikes are ridden by 40-50 something affluent urban businessmen (scarf boys) who may commute on their bikes a few days a week and whose idea of adventure is riding down for a weekend in Marseilles (not that there's anything wrong with that). Even their celebrities they picked to be a part of the promotion were a complete joke with the exception of Charley Boorman. They seemed to be marketing to the urban pop/hipster crowd. Their most important customers are those dealer networks from those countries. Their goal was to drive awareness in their key market but what they were essentially doing is giving the rest of us across the globe their middle finger. This is not a minor thing, but something I feel they need to remedy. There are a lot of good riders here in the US, Australia, Africa, Canada, Mexico, South America, etc... Now to give them credit, they have done this GS Trophy competition every two years now since '06, so I guess there are still a few inside the company who feel it's important to have at least some kind of dirt credibility. However, it seems to me a lot of the events at these competitions aren't even based on the bike, but on the brute strength and ability of each team to cooperate. How quickly four guys can lift a GS over a log doesn't seem the least bit relevant to what a GS is capable of. Another beef was while I think they did a great job this last time of covering the event with daily videos and score updates, coverage in the past made it seem as if they wanted to keep it a secret or something. It was weeks or months before we ever saw anything come out of the South American GS Trophy. That's a lot of money to spend on an event; one would think they'd want to leverage that as best they can via YouTube, Facebook, Twitter, etc... I look at all the new stuff coming out like the maxi-scooter, 9-T, S 1000 XR, etc... I will smack the person in the face who decided to classify that as "adventure." It's a BMW Multistrada (also not an adventure bike). What ever happened to the smaller dirt bikes like the X Challenge? The HP2? Why not make a lighter GS with a 21" front wheel or even 18" rear wheel? It's like they really want to push us dirty hillbilly off road cousins to the back yard away from their more desirable house guests. We'll just be out here playing in the dirt. Don't mind us! I'm telling you, we "adventure enduro" riders will be riding KTM's in the near future! What do you think? What is it you hate about BMW Motorrad? We've all been there, right? You're on a group ride and it gets separated. Someone forgot to "post up," or wait at the turn for the rider behind. This has happened so many times now, I can't even count. It happened day 1 at our High Sierras event and despite the pre-ride lecture and a threat that any violators will get a kick to the nuts, it happened three more times the next day! It happened again at Death Valley a month or so ago and the rider left at the turn wasn't too happy (right, John?). This video of our High Sierras ride opens up with a walkie talkie conversation I had w/Brad Barker where he asks which way they are supposed to turn because no one posted up! http://youtu.be/S_bETUqVpQ8 I think we all get both excited, tunnel vision when we ride, as well as fatigued and just forget. It can really mess up a group ride and even cause safety issues if someone goes down or gets lost. Leap frogging is where the lead rider waits at any kind of turn for the rider behind. When the rider behind comes, they signal each other to acknowledge being seen and then the lead rider proceeds while the second rider then waits there for the next or third rider. I recently saw a different method employed by Jimmy Lewis at his off road training class where he would tell the second rider not only to wait at the turn, but not to move until the last or sweep ride came to that turn. What this does it ensure no one blows by turns without waiting and creates great assurance that the group will stay intact. Let's say you are the second rider behind the leader in a group of five riders. You are told to post up at a turn and then then wait as riders #3 and 4 pass you. When rider #5, the sweep, comes, you then resume the ride and are rider #4. This happens at each turn and after just two turns, you are back to the #2 spot. Each rider basically gets rotated in order. The only downside to this I think is that the more advanced riders want their position up front and don't like to be stuck behind a slower rider. That faster rider could always pass (safely) but then they are going to find themselves posting up at the next turn and going to the back of the line again. I think this modified form of leap frog is best for larger groups and groups with a larger range of experience where "issues" are more likely to crop up. You probably trust the original leap frog method with riders you have ridden a lot with, but I will start to use this modified one for the larger groups. Thoughts? So Why Not a Big Bike? It really is quite amusing to find discussions here and there across the Interwebs when it comes to "what bike should I buy?" You hear some good advice like questions as to what the rider wants to do, what their riding background is, etc.... You also hear some really strong opinions, declarations really, about the bike the rider is supposed or not supposed to buy. A more recent example is when I made a big deal about Noah Horak's statement of what a "true adventure actually is" and "if you cannot pick up your bike fully loaded in any situation, it's not an adventure bike." O-kay, Noah I mean, I get that many peoples' opinions are based on their own real world experiences or what's worked best for them, but it really is amusing to see some people succumb to paroxysms of bitterness and rage if the rider says they're leaning towards a big bike, whether that be a GS or a Super Tenere, Tiger, etc... I think Jim Downs gets it quite well: So much gets said in motorcycle riding circles about motorcycle size. Prominent naysayers hail the trend of larger adventure-style motorcycles coming to market with the fevered zeal of sandwich-board wearing religious zealots crying out about the end of the world from city street corners. But instead of demanding that we repent our sins to Jesus, they try to shame those of us who like to ride heavy motorcycles on the dirt, saying that our bikes are “too heavy” and that we’d be better off with something smaller. Disciples of this “moto-size,” religion are also want to plague social media feeds. Always quick to interrupt otherwise civil threads with some shrill vitriol about why we ride the wrong kind of motorcycle. Like the rapture nuts on street corners, I usually pay people like this little mind. But lately I’m finding their rants more difficult to leave unanswered. I see the bike you choose to ride simply as a tool you picked from a tool chest. Some tools are better suited for some tasks better and worse than other tools. I am completely bike-agnostic too. I used to own a KTM 500 EXC and it's a fantastic bike! I wish I could have kept it but with no truck/trailer, I wasn't riding it enough to justify parking that much cash idle in my garage. I know many of you also own small bikes, touring bike, choppers, etc... Is owning a big bike expensive? I don't really know... How much is a second vehicle (truck) or trailer, gas and time (limited to 55 mph w/trailer) worth? I can ride a few hours to a destination, camp off my bike, ride multiple days off road and then get back on the pavement and ride home. That seems like quite a value to me. But see, I'm the rich guy! That's what a guy who is retiring at 55, has paid of his mortgage, has a tricked out jeep, toy hauler and multiple bikes once told me. I really love my big bike! Yes, it's the first motorcycle I've ever owned (I did ride scooters in high school/college but that doesn't count). Yes, I hadn't nearly a clue about adventure enduro riding (vs. adventure touring) when I first got it. Yes, it did take me quite a while to figure out how to ride it. Yes, I may have found a smaller, less expensive bike easier to learn on. But I really have no regrets. I've seen many people also figure out that riding these bigger bikes off road is not as hard as it seems with a few pointers, feedback and some professional instruction. I have seen SO many great places, met SO many great people and have had a blast riding my big bike. Yes, it does take a different and more focused set of skills to ride a big bike off road but therein lies the fun! Ryan Frazier (GS Trophy Team USA '12) said something to the effect that he prefers a bigger bike off road because they require more input and finesse and that it's the challenge that makes it so much fun. Obviously falling and getting tired from lifting your bike isn't so much fun, but with time and a few friends around, the challenging parts become a lot more fun. I personally cannot stand Harleys but I realize they are popular and there's a lot of people who enjoy riding them. That's why I do not care to bash them here or there because I really don't care what another person's choice of ride is. It has no effect on me whatsoever. But that also means I do not care to share a forum, Facebook group or online community with Harley riders. We're just different, that's all. I really don't care to hear about how shiny and loud they are or how I'm "doing it wrong." And as much as I still love the smaller bikes, I really don't care to hear from someone who's never ridden a big bike off road how I'm supposedly ruining "their" trails; my bike is not practical to ride more than a simple fire road; I'm carrying too much; I should have started on a smaller bike, etc... Bigger bikes are just that polarizing I guess. That's why I think XLADV makes so much sense. We get it. There's no explanation or defense of our choices required. So Is the New BMW GSA Better Off-Road Than the Old One? Is the new liquid cooled GS Adventure better off road than the older oil-cooled one? Yes, it is! No, it’s not! Who is right? I can’t seem to find a decent answer. I could just buy a new one and judge for myself, but that day hasn’t come yet. On road, I think there’s no doubt the new bike is an entire new generation of all around road performance. It’s clear they mean to compete more with the street touring segment. For me, the answer is that it may be a better bike off road, but there are a few features that make it worse off road. The best comparison I’ve seen was this video Touratech USA did with the new LC GS vs. the old GS (Adventure model hadn’t come out yet). And then more recently there is this article from ADVMoto, which I found a bit disappointing. They showed the two bikes with different tires (street vs knobby), compared the new GSA to the new LC GS on an inclined hill on loose terrain when the article was supposed to compare to the old GSA and made mention of the new wider wheels making it better on-road but not addressing whether that made things better or worse off-road (I think worse). Let’s not forget the psychology going on here either. Some might say I’m skeptical because I own an ’11 GSA and want to protect my resale value by not acknowledging the new GSA is better. But I think there’s an opposing psychology with new LS GS/GSA owners to justify their expenditure by denying the possibility it may not in fact be better off-road. Let’s take a look at what some of the advantages off-road of the new GS might be: Higher snorkel that is better for deep water crossings Better oem suspension quality, as well as a longer swing arm that allows the suspension to operate more efficiently Retaining front wheel ABS off road makes for more confident cornering Active ESA keeps wheels planted when applying brakes (goes into soft mode) Narrower at the seat makes it easier to grip with the knees and contributes to a lighter feel Wet clutch better suited to high temps seen in off-road conditions Some sort of vague point about how the new frame geometry makes the bike handle better off-road (not sure why that is) And the disadvantages: Taller gearing. Even with heavier mass on flywheel to aid in the low end, it’s still more prone to stalling at slow speed maneuvering and uphill starts. And it’s not the wet clutch; it’s that you have to use the clutch so much more. Wider wheels. The front is more likely to deflect, which is probably why it comes standard with a damper. It’s likely more difficult to handle in deep sand because of that. Wider rear tire spreads out force over wider area making cornering on loose surfaces more difficult (prone to skip rather than bite more so than a 150 width tire). Radiators are one more thing that can break off-road leaving you stranded. (Edit 5/10/17) First year and a half models had front tubes prone to cracking. They fixed for latter half of '14 models. (Edit 5/10/17) Now issues surfacing since at least Nov '16 of fork stanchion separation. (Edit 5/10/17) Other issues with transmissions failing. What would have really excited me was if BMW had gone a bit bolder with the GSA (as KTM was with their 1190 R) and had made it with 21”/18” wheels and kept the lower enduro gearing. What do you think? Size matters. It does! (snicker) For adventure bikes, at least The smaller bikes are more fun and forgiving off-road but then they compromise considerably with cargo carrying capacity, fuel range, highway comfort, service intervals, etc… Bigger bikes can surely carry more stuff (even a pillion) and cruise more comfortably and further on the highway, but it takes a bit more skill than most have to confidently handle them in the more difficult terrain with all that weight. Leave you gear at camp and they become even more fun. A lot of us big bike riders kind of like that challenge and have found that while most of the world’s roads are in fact dirt, they’re not all that bad. We may not take the hard way to Magadan or attempt to cross the Simpson Desert, but we'll get there just the same. At XLADV we get that. Size matters. I'm getting ready to do the IDBDR later this week. One guy I've ridden with before and one I haven't. They guy I haven't ridden with before has ridden with other guys I have ridden with and he seems like a great guy so I'm not sweating it. But this got me thinking how important rider selection can be, especially for a big trip like this. Think about it, you invest lots of money in new gear, farkles, etc..., not to mention time off work and away from family/loved ones. The last thing you need is someone messing up your ride. I have ridden with a LOT of people in the last four years. I'd say just about every one of them is a very good person. But let's face it, what we do is REALLY demanding! Think about the fatigue, hunger, dehydration, stress, injury, etc... that you get put under during an adventure ride. That's an environment that reveals peoples' character very quickly. Let's face it, there are probably a few people you can think of whom you'd never ride with again, am I wrong? But wait a second... what if you are someone people don't want to ride with again?!!! "What if I'm THAT GUY!" I think it's important to look in the mirror and ask yourself "how can I be a better group rider?" Are you ready to go at the time agreed upon for "kickstands up?" Is your bike packed with all the right tools and gear? Is your bike in good working order? Do you have GPS and know how to use it or do you just hope to follow someone who does? Do you know how to change a tire or perform routine trailside maintenance? Do you ride too fast? (guilty) Do you ride too slow? Do you ride recklessly? Do you bring riders on trails way above their ability? Do you show up for rides you know are way above your ability? Do you stop to help a fellow rider lift his/her bike? Do you thank someone who helped you lift your bike? Do you space out? Do you get hangry? (guilty) Do you not post up at turns? Do you pass unsafely? Do you roost others? Do you ride too close behind others? What other important riding etiquette do you think is important to mention? Tell us here or drop in our Beyond Starbucks section where you can find a safe place newer riders can learn about these things and more experienced riders share their wisdom and experience. How High Do My Handlebars Need to Be? Has Adventure Riding Become the New "Gluten-Free?" Has adventure riding become the new gluten-free? Everything in the grocery store now seems to carry a label “gluten-free!” I bought bacon the other day and saw it on the front. It’s BACON! Of course it doesn’t contain any gluten! Likewise it seems with “adventure.” Everything seems to be “ADV” this or that. Even BMW’s new S 1000 XR comes with the “adventure” moniker even though it’s probably the last bike I’d ever use for what I define as adventure riding. Look at me, I’m going adventure riding! It’s not really that important to me how people ride their bikes or what terms they use to describe their riding. But for me, “adventure riding” does still hold more of a finite than infinite description. I guess the classic and more narrow definition of adventure riding would be something like this: Any motorcycle journey of perhaps a week or longer, probably international or at least out of one’s comfort zone involving travel over multiple road surface types (not solely tarmac/bitumen/asphalt) where the rider is most likely camping off their bike and/or sleeping in a different place most nights, raising money for X charity and documenting their epic selfies with a GoPro camera and becoming social media commodities. Okay, so I might have been kidding about those last parts. Personally, it’s meaningful to me to understand what I consider adventure riding is as well as what it’s not. I’m very open minded and have become even more so over time but there are still some things I find bug me about it. I understand that adventure means different things to different people but when I hear someone talk about throwing their un-plated dirt bike in the back of their pickup and going “adventure riding” for the day, I just kind of shake my head. I understand that guy sees it as an adventure of some kind. I just don’t see that as “adventure riding” myself. 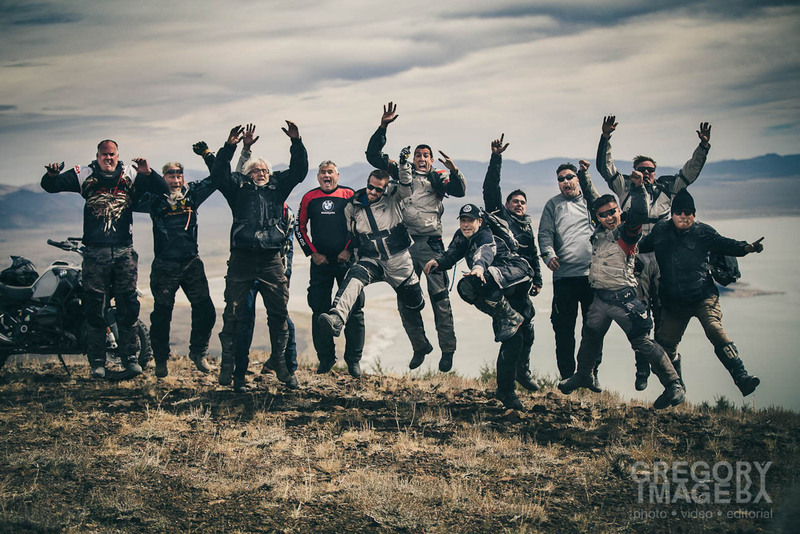 I recently had the opportunity to pose this question of how does one define adventure riding on a Facebook group, IBAR (International Brotherhood of Adventure Riders; 8,300 followers) and got some really fantastic responses. I learned a lot! My perception of adventure riding has definitely been expanded, but I find I’m still clinging to my own tastes in certain areas. Believe me, if there’s one thing I hate it’s a “bike nazi” who sets up rules of what you can/can’t do. I don’t want to be “that guy.” But when a word starts to mean anything, it means nothing. I’m really good with broad brushes but if all I’m seeing on a canvas is a blob of neutral color with no shape, definition or story, I’m lost. I also know that simply owning an “adventure bike” doesn’t equal adventure riding. I own an adventure bike and on the rare occasion I commute on it, I call that commuting, not adventure riding. I might go ride some twisty canyon roads on a weekend and prefer to call that canyon carving, not adventure riding. I might go do a track day and would call that track riding, not adventure riding. Recently, Tolga and I took his new camera assistant, Gozde, out for some dirt training and a little trail ride. I’d call that trail riding, not adventure riding. I sit back and look at all the riding I’ve done over about four years and 56k miles and guess that maybe only about 20% of my miles were what I personally would call adventure riding (e.g. Bolivia, Baja, AZBDR, COBDR, etc…). I do a lot of these three day weekend trips to say, Death Valley, and camp in one spot and ride trails out and back each day. I guess that’s really more trail riding than adventure riding. I also don’t think one even needs an “adventure bike” to go adventure riding. Some of the best examples of adventure riders did their journeys on bikes most wouldn’t consider adventure bikes: Harley Davidsons, Honda Goldwings, Honda C90’s, old Triumphs, BMW RT’s, etc… This being XLADV, I still don’t think adventure riding requires any kind of “XL” or big bike component (doesn’t hurt). Not everyone has the time/money to be a Ted Simon, Austin Vince, Lois Pryce, etc… I think the longest motorcycle trip I’ve done was just two weeks. A lot of the riding I do for fun locally I view as kind of training for future adventure riding, so in a sense I kind of see how the term gets expanded. Interestingly, I find the more regional trail riding I do is many times more adventurous and enjoyable than the two weeks of riding I did in Bolivia. The riding conditions there were pretty bad, actually. There were lots of narrow, dusty and dangerous dirt roads and no interesting single-track, challenging hills or beach riding like I’m more used to. The adventure there for me was in the places I got to see, the people I got to meet rather than the riding itself. I guess the “death road” and seeing a hillside road slide down a thousand foot cliff in front of me was adventurous. It’s also just a convenient classification we use to distinguish ourselves from other motorcycle sub-cultures like café racer hipsters, sport bikes, choppers, cruisers, tourers, moped gangs, etc… (yes, there are moped gangs). In sum, I guess I can say that while my definition of adventure riding is already quite broad and has been expanded, it still holds specific meaning to me. That meaning is just one person’s opinion and not a test, label or judgment passed on anyone else. I’ll leave the reader here with some of the responses I felt were noteworthy: Notion of picking a spot on the map and going seems to fit. Something new, different, destination unknown, more for the journey than the destination. Live, ride explore. Not everyone can take a multi week multi country trip. For some, a good day ride on a new more challenging track is all we have time or allowance for. Anything new, or more challenging that pushes our bubble just a bit bigger is an adventure. It is to each of us a personal experience. For me it's travelling. Whether it a weekend of logging roads near Algonquin (& camping) or longer, mostly pavement trips. 10 days in Canada's East Coast & 6 weeks through Western Europe. Just getting out there and being. I think the term "adventure" is relative to each person. Hey, if it's an adventure to you based on your everyday life, then more power to you. Live your adventure. Single definition of adventure riding don't exist!! All depend what adventure means to YOU.. My idea of adventure riding. It's not about the route but about the journey. Alone or with a friend pick a spot on the Map and go there. It's always different, take pictures, enjoy the people places and the ride. I think you can define it as whatever you like. My personal definition, is having the ability to go off road and find a nice camping spot. I'm on an adventure every time I ride, even if I don't hit dirt that day. For me, an adventure ride HAS to include some dirt/off-road sections. Adventure to me is not being on Tarmac 100% of the time. Gravel, OHV trails, minimum maintenance roads and preferably not sleeping in my own bed. Explore riding is what I do riding to see where a road goes I've drove past a hundred times in my truck. Riding is fun and every ride to me is an adventure but if you can ride trails fire roads freeways you are an adventure rider. Adventure is a mindset (Harold Olaf Cecil) Adventure is in the heart. In my opinion. If you can't go out and have a good time, no matter what. You're NOT an adventurer. If you break down and say, "that really sucked"...but it was AWESOME! You ARE an adventurer. If you're on a ride with friends and have something to complain about. You're NOT an adventurer. If you can jump into a ride, last minute without caring where the destination is, you ARE an adventurer. I don't see it about being on dirt or bitumen or related to time or distance traveled. I see it as being open to try new places, roads, tracks and experiences, and being willing to go out of your comfort zone to have those experiences. It's about learning and living all at once. Well I have to say this much for you Eric Hall, you do ask some great questions and start some good threads. The marketing department at BMW really knew what they were doing when they attached the word Adventure to there bulked up GS back in 2001/2002. At that time the GS was just a moderate seller in their lineup of bikes. Now today it is their biggest seller. I think as a definition in the motorcycle world the Adventure bike was meant to be a do everything machine. Tour the freeways and highways with ease and comfort as well as get you though some fairly rugged stuff if you had the balls and the skills to ride it there. KTM soon produced a twin to compete and now there are more and more bikes that have a wider range of capabilities because that is what people think they want. One thing is for sure, the Adventure market has opened up a lot of opportunities that did not exist before. Look at all the companies like Touratech just for starters who have thrived because of this segment of motorsport. I echo the sentiments that riding in general is an adventure, but that does not mean you are necessarily doing it on an Adventure bike. If you are riding and you want to call it "ADV" riding have at it I say, want to put knobbies on your bike and run back and forth to Starbucks well maybe it's not so ADV'ish To me if it’s all pavement it’s not ADV. All pavement is touring or sport touring. ADV includes some dirt and generally longer distances. Dual sport is similar but shorter distances. The original intent of the term was to draw a distinction vs. other forms of riding My definition......the bike has to be plated and at least some of the riding must be off the pavement.......now if you're lucky.......MOST of the riding will be off the pavement and involve tents, sleeping bags and a bourbon of some kind! "That's What's Fun About Riding ADV Bikes Off-Road is the DANGER!" No, dumbass. It’s not that dangerous and please don’t ask to ride with me! Is it really though? I don’t think it is (or has to be). Obviously we have accepted the risk that goes along with riding a motorcycle, but I have to only look at my friends who ride mountain bikes, road bikes, play softball, etc… and notice all their injuries. It makes what we do look safe, really. I was injured myself once (right Achilles tendon) and have seen friends get hurt but it’s really not that common. Danger carries with it a lot of romanticism though and that is surely used to sell the whole “lifestyle.” I think there’s a bit of that in Brad Barker’s (Ride of my Life) video he did last year on AltRider’s “Taste of Dakar” event. There certainly can be quite a bit of danger in what we do if you don’t know what you’re doing and/or if you simply don’t pay any regard to safety. Here are a few things I think contribute to safe riding: Gear. ATGATT. You need a good helmet, good boots, good gloves and a good riding suit with good armor. I took a particularly nasty spill doing the COBDR (riding too fast to slow down in time for a washout). My fellow riders thought I was going to be seriously injured but I just got up and dusted myself off. I had a small bruise on my right quad the next day and that was it! I also wear a neck brace (Leatt) as well as knee/shin guards. Proper bike prep. Don’t think you’re a stud because you ride off road with street tires or something similar. You’re just dumb (in my opinion). Ride with knobby tires (aren’t completely worn off). Adjust your seat, pegs, bars, controls so that you can ride comfortably, particularly when standing. Have a bike that’s in good working order with all the tools, spares, etc… you need to handle most roadside repairs. Have enough gas to get where you’re going plus a safety margin, but if you have a GSA and are only riding 60 miles of trails that day you certainly do not need 8.7 gallons of fuel compromising your bike’s off-road handling. Nor should you be riding with hard panniers off-road if you don’t absolutely have to. Air down your tires enough to give you a better contact patch, but not so low you risk damaging your rims (about 30 psi on my bike). Tell people where you’re going and when you’ll be back. Use a SPOT/DeLorme type satellite device if you can. If you have a GPS with tracks, for chrissakes please know how to use it! Proper body prep. Riding a big bike off road takes a higher level of fitness. Consider going on a diet and exercise regimen. I recently lost 30 lbs myself and notice it’s a lot easier to ride. You should also eat enough and bring enough water (1 liter/hour) and drink it regularly to avoid dehydration/exhaustion. Maybe a session of endurance drinking the night before isn’t such a good idea prior to spending all day on the trail. Accidents always seem to happen when you’re in that “yellow zone.” If you really like riding off road and spend most of your seat time doing that, consider investing in some formal off road training. It’s the best farkle you’ll ever buy. Proper riding technique and trail/group choice. 100 miles from the nearest highway is not the best place to practice wheelies or riding near 100% of your maximum speed. Slow is fast. Don’t ride beyond what you can see. Don’t ride in dust. If you stop, get off the trail. Joining a group of dirt bikes when you have less than a year of experience (and no formal training) on a big bike is not a wise idea. Joining an “A” group when you’re a “C” rider is also not a good idea. Never ride at a pace faster than you’re comfortable with (they’ll wait for you). Grow up and leave the need to compete or prove your riding skill behind (no one cares). Stop or “post up” at a turn and wait until the person behind you reaches you so they know which way to go. If it’s getting late and you have a bailout point, take it. Don’t pass other riders unsafely. Pick a spot in the riding order you’re comfortable with and stay there. Know how many people are in front and behind you.